is the first reliable Moon/Sun eclipse calculator ever made. It is an analogue computer, which shows the eclipses of the Moon or the Sun with a small moon pointer. At the upper part of the front there is an engraving of the illuminated Earth and at the lower part the shadow of the Earth is engraved. When the key is turned the pointer with the moon is activated. When the moon happens to cover the earth engraving, an eclipse of the sun is taking place, and when the moonpointer meets the shadow of the Earth, an eclipse of the Moon takes place. This can be seen on the Lunar Eclipse side of the machine. The Eclipsareon was constructed on the basis of the Danish astronomer Tycho Brahe’s observations of the eclipses. The Eclipsareon became famous for its reliability and for its accuracy. As the Eclipsareon shows the Moon and Sun eclipses with approximately 98% coverage over a 200 year scale it is considered to be unique by modern astronomers. Roemer constructed an ingenious and exceptional mechanism. Circular offset cams were used for the first time in history. Two offset cams rotate counterwise to the moonpointer and the key. They represent all the movements of the Moon. A gear turns accurately and drives two scales – one for the decades and one for the single year. Like the Planetarium the Eclipsereon illustrates a 100 years on both sides of 1680 – the year of its completion. The first hundred years illustrate the observations of the Moon, and the next hundred years predicts the wonders of the eclipses. On December the 5th. 1681 the planetary machines were demonstrated to King Louis XIV. 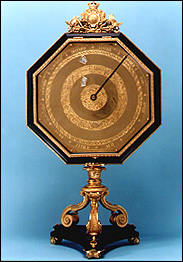 The Eclipsareon was altered 12 years later when Rømer brought it to Paris in order to get it adjusted – the adjustment marks and the date, November the 4th. 1687, are engraved in the original and in the replica as well. The diameter of the Dials is 490 millimetres. The height of the Cabinet is 1010 millimetres, and it Width is 550 millimetres. The Weight of the complete machine is approximately 27 kilos. Poul Darnell: The Planetary Machines at Rosenborg. Article in ISBN 87-0053-8.